Back in November, we were excited by the removal of the large hoardings that kept the new Public Bar obscured from prying eyes. On one of the most prominent sites on the Southside, it was always going to set hopes high. We liked it, but felt overcharged by a venue effetively facing a service station. Having been informed prices had been lowered and the menu revised, it was certainly worth another visit. On a cloudy mid-April day we returned, tempted by the idea of a pie. Similar to our much loved martinis, a pie can be a great measure of a kitchen’s output. With a simple combination of meat, gravy and pastry its always interesting to see how every venue – from service stations to fine dining restaurants – interpret the classic. However, before we get to the pie, its worth reflecting on the fit-out that so impressed us last time around. The wooden floor is a highlight many may miss, and worth noting it was placed on a brand new slab rather than being a clean up of an original. Similarly, the white tiles on the walls with their irregular layout looks as though it has been there since time immemorial. In truth, the tiler was instructed to lay them in a slightly irregular manner. Looking at the expanse of walls decorated this way, one can only imagine such a job drove the tiler to drink the entire contents of the bar on completion. It was worht the tiler’s trouble; it is a highly effective technique evoking a sense of history. In terms of service and style, it appears the bar has stepped back slightly from the rather brash attitude it adopted on opening, when being the new kid on the block meant the comparatively high prices (that over time deterred many punters) have been tempered slightly, bringing them into line with other premium venues around town. Draught beer starts at $7.00, with a glass of wine available for 50c more. In fact the wine list, featuring categories such as GLUGABLE REDS and UNPRONOUNCABLE WHITES, adds a sense of levity missing from so many venues opting for a more conservative and risk averse approach. 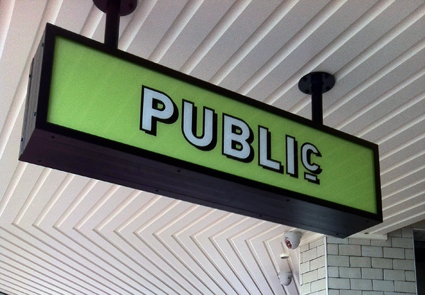 Consideration has also been made in regard to what a public bar represents, and a chalkboard now offers a number of specials available over the week on wines, beer and pizzas (perhaps next year we’ll see a quiz night?). This all adds to a venue looking to establish itself as a local social hub rather than ‘the place to be’. The former usually enjoys greater longevity than the latter. If you’ve managed to read through our thoughts so far, you may have built an impression we liked the venue. We really did! As the pie landed on the table, we were taken by the golden pastry, its sizeable girth, and the tidy nest of minted peas which were not quite pureed, rather left slightly chunky to provide a textural contrast to the mash. Cutting through the pastry showed a satisfactory flakiness in the outer layers before revealing a solid casing and the contents within. A rich slightly salty gravy with large chunks of beef spilled forth onto the plate, mixing with the mushy peas. 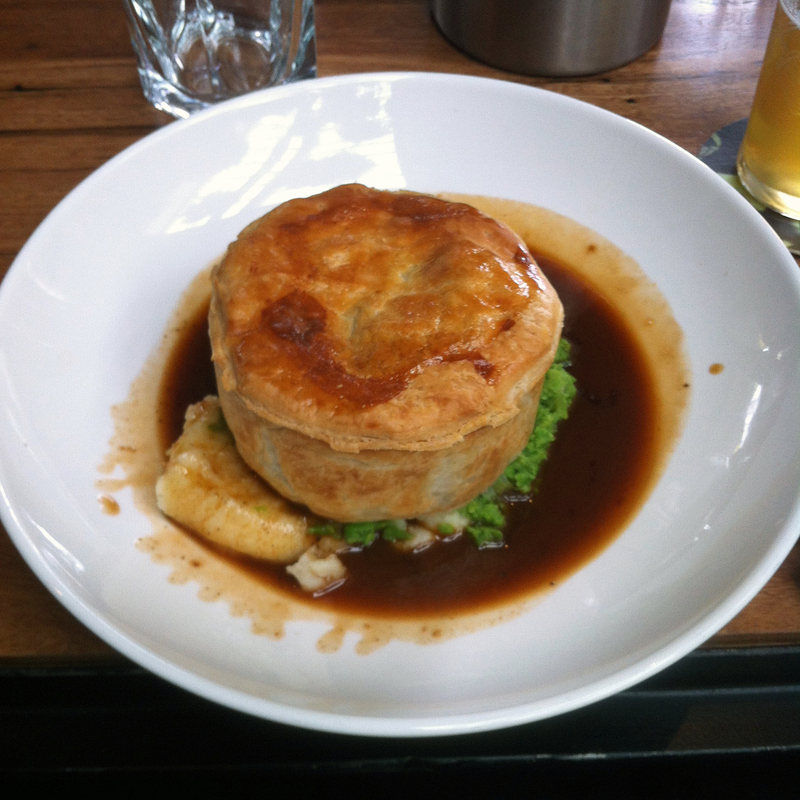 It was, in all ways a great pie worthy of a good pub – something it appears Public Bar is well on the way to becoming. Thank you. Glad u enjoyed it.